Almost without exception, every one of my classmates from business school has a LinkedIn profile. There is a reason for it: I know someone who added a number of skills to his profile and heard from a new recruiter within 24 hours. The latest wave of people requesting I add them as contacts is a group of young women who were my students in high school; they are now seniors in college, and someone in the career services office is doing her job, directing these soon-to-be-graduates to start building their networks. You never know which friend-of-a-friend might make you a contact that wins you your next job. My business school peers keep their profiles up to date, and a small handful of them use it to let us know what they’re reading or which professional conferences they’re attending. Allow me to politely stifle a yawn. Social networks in general are distrusted by some people my age and older, and I have plenty of friends who won’t have anything to do with them. Others perceive that people seem to like it and go ahead and join, only to wonder “what’s the point?” and never get around to turning Facebook into something they use. This is where I am with LinkedIn: I pretty much understand what it’s for, I joined without hesitation, I generally add people who request that I do (assuming I know them), but I don’t go there every day. I have yet to perceive that I have gotten anything from my membership in LinkedIn. Wait: for a while there was a lot of regular email, featuring the promotions and new jobs of my classmates. I am happy for them, but I found it depressing. I changed my settings so I don’t receive updates anymore. LinkedIn offers a dizzying array of settings for the annoying email membership will generate, and even if you limit it to weekly updates, it will be too much if you belong to any groups. On LinkedIn, I cannot have my name appear as I prefer, with first, middle and last; it’s simply not an option. No doubt there are other women and men who find this frustrating. I am allowed to create my professional “headline,” but must choose from a limited list of industries. What industry do you work in when you left education to get a new degree and are now unemployed? For a while there I used “Think Tanks,” because I thought it was cute. These days, being unemployed is not very cute. I do not have a picture on LinkedIn. I do not consider myself photogenic, and I do not have a professional looking headshot. Probably I should get one. I do not have a resume on LinkedIn. I have done a variety of things as an adult, and could easily generate three mostly different resumes, focusing on different aspects of my experience. I tend to need to tailor my resume to the role I’m applying for. I do not currently have a job, and when I was actively looking, I checked LinkedIn regularly. Facebook, for all its evils, especially its obvious desire to exploit its knowledge of my personal interests for its own monetary gain, still has enough appeal to me to inspire a daily visit. (If you know me, you know that “daily” is inaccurate, and might better be replaced with “hourly.”) LinkedIn throws advertising at you, but from what I can surmise from its financial statements derives roughly half of its profits from its hiring services and the rest from marketing opportunities and premium subscriptions. The platform remains consistent, does not add annoying features, and has not yet proved a breeding ground for dreadful spam postings when members’ profiles are hacked into. In these regards it is much better than Facebook. Yet I still hate it. Sometimes, Facebook makes ridiculous suggestions of friends for me, or advertises to me guessing that I am interested in Ugg boots or veganism or over-weight or single or Jewish. 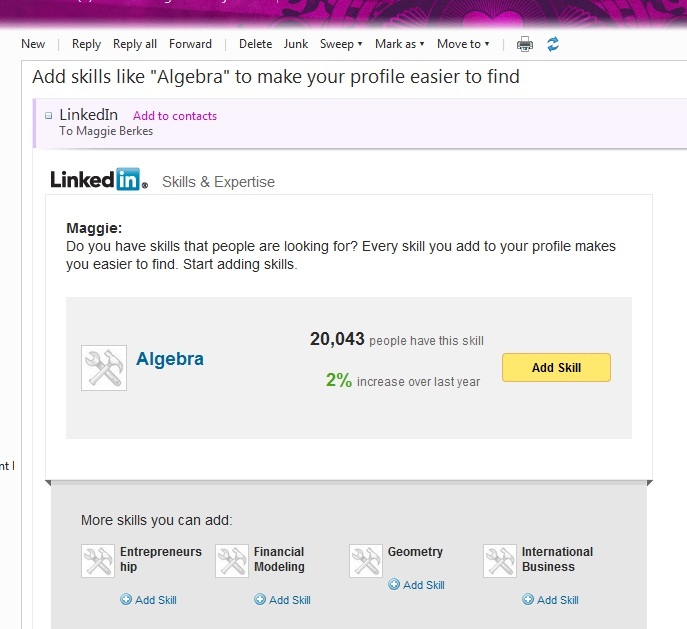 LinkedIn also makes ridiculous suggestions, like to add “Geometry” or “Algebra” to my skills list. Do they also have “good grammar” or “proper spelling” or “biting sarcasm?” When LinkedIn reduces my profile to a set of searchable key words, I am reduced, flattened, sampled from, and not fully represented. Facebook may violate my privacy, but at least my quilt-making pictures are all there, along with photos of grapefruit, horses, birthday cakes and sand castles. I can enjoy a small victory on Facebook every time someone “likes” my status. LinkedIn says they have one hundred thirty-five million members. Here is that number: 135,000,000. If they can actually help me find a job worth doing, then I will stop hating them. But I’m still pretty sure I won’t visit them every day. I hate it too. You are reduced to a few words. This is a minority opinion.